We have installed, operated and managed many power facilities at no initial cost to the client receiving power and thermal energy. We will, invest-in, design, operate and manage your CHP project. Why not let the experts at InventivEnergy complete your project and manage the risks associated with operating a power plant? Our CHP projects typically provide a user significant savings on electricity of over 20%. For many hosts, these savings add up to many hundreds of thousands, even millions, of dollars of profitability to their bottom-line. InventivEnergy will complete your project, at no cost to you, and deliver savings and peace of mind. In this new age of frequent "super-storms", reliable power is a critical concern for many industries. Our CHP systems, will provide most of the power and thermal energy required for industries to continue operating in the event of a grid outage. Imagine, your primary source of energy located on-site and dedicated only to your needs. InventivEnergy CHP systems utilize readily available equipment from manufacturers like GE. Our systems are the most efficient available and since almost 90% of the clean natural gas fuel is utilized, our installations result in a carbon footprint reduction of over 50%. What could be better than cutting emissions while saving money? 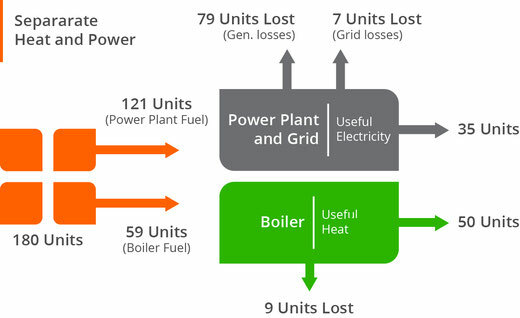 Combined heat and power is the most efficient type of distributed generation power plant and uses a single fuel source, typically clean natural gas. This single fuel source produces two types of energy; electricity and thermal energy, which can be used for steam, heating, and cooling. 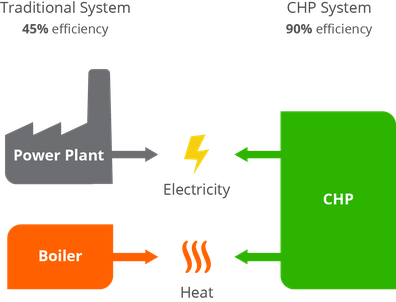 CHP is different because the energy is produced at the point of use, or on-site, as compared to producing thermal energy on-site in a boiler, and receiving electrical power from the grid. Our CHP systems produce on-site energy and provide most of the electrical and thermal energy needed for a host/user, while the connection to the grid remains intact, maximizing reliability and efficiency. In most inefficient configurations, the exhaust from generating electricity is simply sent into the atmosphere. There's a great deal of heat in the exhaust that can be used for other applications. Our CHP systems capture almost all of the energy in the exhaust after the electricity is generated. This is accomplished through a highly efficient heat exchanger, or heat recovery unit, where the energy in the exhaust is transferred to make hot water or steam. This concurrent capture of thermal energy is the fundamental means by which efficiency is maximized. When power is generated on-site and thermal energy is captured and put to use in industrial and heating systems, fuel use in minimized, which translates to significant savings and a 50% reduction in carbon footprint. CHP is one of the most important applications for a sustainable future. One-site generation decrease distribution system congestion. Make the grid backup. Can operate isolated from the grid. Cuts the risk of blackouts and power losses. On-site CHP provides for peace-of-mind and minimizes the potential for interruptions in power supply. Our CHP installations become the primary source of electricity and thermal energy and essentially makes the grid your backup supply. 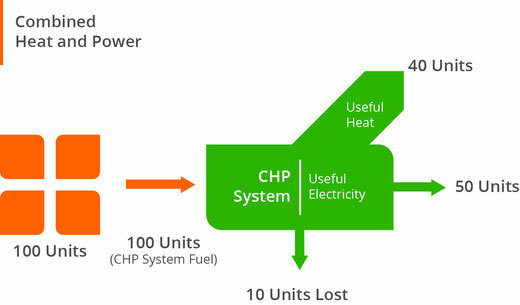 CHP puts almost all of the fuel used for power generation to use through capture of exhaust heat. Our installations are up to 90% efficient and basically double the energy output for each unit of fuel compared to conventional grid connected power. Since CHP produces almost all of your power and thermal energy on-site, fuel use is greatly reduced. Equivalent emissions are cut in-half. For example, installation of a 5MW CHP plant is equal to removing 5,400 cars from our roads. Our CHP plants typically see savings of over 20% on current electricity costs. Lower long-term power pricing vs. the grid through our Energy Purchase Agreement. Our systems require no investment from the client. Significantly reduces risks. InventivEnergy takes care of the details related to your project, at our cost. We'll design, install, operate and manage your project. You enjoy savings, enhanced reliability and satisfaction that comes from reducing your carbon footprint.